Behold: Bust A Mine. My first iOS development project. When I set out to (once again) try my hand at iOS development, I didn't know what the future would hold. It was around the time that a former game that I worked on, Clone Wars Adventures, had announced that it would be ending on 31 March 2014. One of my favorite mini-games in CWA was called Mine Buster, a simple game that involved creating a chain reaction for points. It was also a mini-game that would soon cease to exist. And a good mini-game that could use a Spiritual Successor. I started working on my own rendition in early March while professionally employed as the Director of Technology at Molten Games. Within two weeks of late-night spare time I had a working prototype that functioned similarly to its inspiration. I had heard good things about using Cocos2D 3.0 and it seemed to fit the bill. My prototype was still very rough and could only run on the iOS Simulator that comes with Xcode 5. However, I was happy enough with the progress that I decided to spring for the iOS Developer Program so that I could actually run and debug on my iPhone and iPad. There was a little learning curve to overcome as running code on the device requires creating App Identifiers, Certificates for code signing and Provisioning Profiles for signed code to be allowed to run on the device. Being able to run and debug on my devices was instantly gratifying, but also revealed another issue: the need to deal with different screen sizes (iPad vs. iPhone) and aspect ratios. It was time to start finalizing the art--getting real assets at the necessary sizes and building out the art style. For this, I'd actually need an artist. Fortunately, Molten's UI artist was on-board with the project after seeing the prototype running on my phone. He had free reign with the art style and created a look inspired by the likes of Geometry Wars yet unique in its own right. We worked together to integrate the art into the game and iterate on the style. Unfortunately, Molten Games collapsed around this time, towards the end of March. Priorities shifted to finding a new day job since this project was a journey of Experience and less of Business. Working with an artist brought to light another need that I'd have to figure out: distributing test builds of my app to other people. For this I began using Test Flight. This provided a great way to bring testers on board and get feedback. The only issue was minor: when a new device was registered, I would have to add the device's unique identifier to the provisioning profile and upload another build of the app. 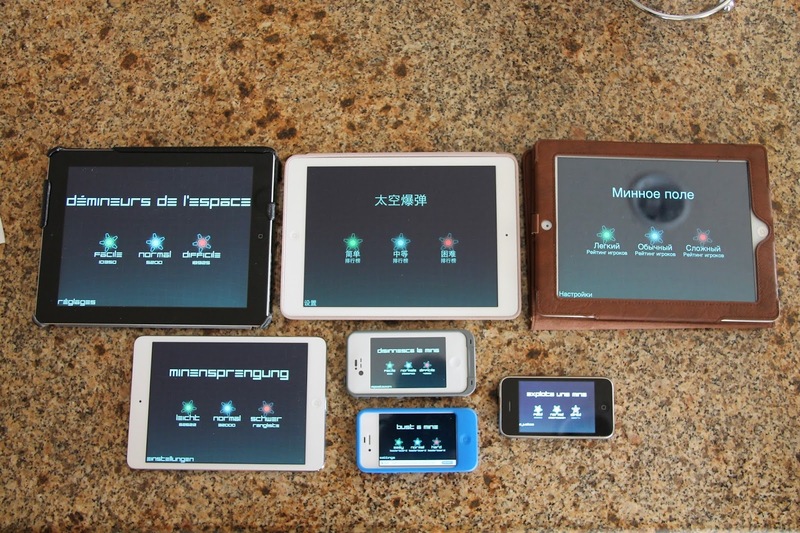 I started acquiring testers with a broad spectrum of devices. I also acquired a few devices of my own: non-Retina iPad and older iPhone. I was also blessed with winning an iPad Mini in a contest! I made sure to also test on the newer 64-bit devices. Through this I actually discovered some 64-bit compatibility issues with Cocos2D 3.0 (in beta at the time) and worked with the developers to solve them. I can understand exactly one of these. Having visited Moscow and Shanghai for assisting Planetside 2 localization (and working on games for the past decade or so), I'm constantly reminded of the worldwide gaming community. The English-speaking community might be easier for me to market, but it's a small part of the world. Therefore, I wanted to make sure that my app could be distributed and popular in other locales. I had a very small number of strings (less than 100), so professional localization would be fairly easy. I originally started working with Rev.com but found them difficult and obtuse. I ended up going with e2f and found them slightly more expensive, but very easy to work with. They appreciated all of my contextual notes and turned around six languages (French, Italian, German, Spanish, Russian and Simplified Chinese) in less than 24 hours. In hindsight, I should have included a few more items in the translations, such as future (generic) update notes and anything that I would potentially need in the next few months. This game, since it was an exploration of experience, was going to be free and advertisement-supported. However, given the ease of doing in-app purchases, I would offer an in-app purchase to remove the ads. I also wanted GameKit integration to essentially have free Leaderboards. Fortunately many kind developers have written simple APIs around these pieces of functionality and have shared them for free. Integrating the likes of ABGameKitHelper and MKStoreKit was very easily done. My testers also suggesting graphical features such as using UIMotionEffect to simulate a parallax display on iOS 7+. Having some manner of background music was important to me. However, I'm not a composer. I don't really know many composers. So I started looking for free music. Interestingly, though, "free" isn't always free. Some companies let you use their music for free for certain purposes, and an app is not generally one of those free uses. I originally wanted to use some songs from Freeplay Music, but after seeing their licensing requirements and reading about their litigation processes, I decided against it. I ended up using music by Chris Zabriskie who offers his music for free with a Creative Commons Attribution license. I feel that his music meshes well with the peaceful, soothing nature of Bust A Mine's laid-back gameplay. I've heard of using a test market to pre-launch, so I figured I'd give that a try. I have some friends with family in the Philippines and it seems to be a fairly popular test market. Launching in the Philippines also revealed an interesting fact: iAd isn't available in all parts of the world. Therefore, my advertisement strategy would have to change for a worldwide launch. Bust A Mine officially launched in a limited capacity on 9 May 2014, about 9 weeks after development started. Considering that it was my first foray into iOS development and Objective-C programming in general, I'm calling that a success. Not a business success, but an experiential success. For the full worldwide launch, I'm waiting for Apple to approve the next version that will integrate Google AdMob as a backup to iAd. I really enjoy iOS development. The Objective-C language allows for easy checking to see if features are available on the device it's running on. Furthermore, the Xcode integration with Apple back-end services is very well done and easy to use. Want GameKit integration? Flip a switch and you've got it. Several people have asked about an Android port as well. Interestingly, no one has asked about a Windows phone version. In any case, I'm considering a port to Cocos2D-X, a C++ library that supports all major mobile platforms. I've got plenty of ideas for Bust A Mine for the future. And a few of my game designer friends have offered some feedback and ideas of their own. Plus, I have more ideas for future games as well. Mobile development has become a fun little hobby for me. 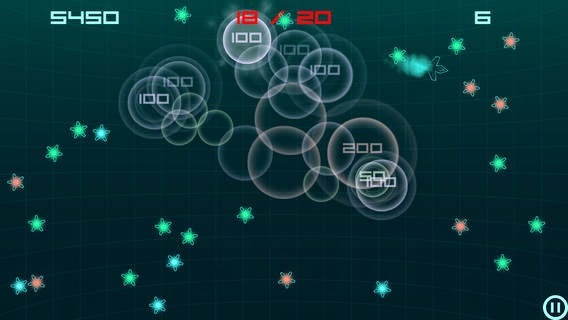 Download Bust A Mine and give it a try. Leave a review or rating if you feel so inclined. And let me know what you think in the comments!